Let me be the first to wish Bill O'Reilly a very Happy Winter Solstice. The precise moment this year will be December 21, 2006 at 7:22 p.m. EST (00:22 UTC on December 22). For those of you scoring at home, "solstice" means "standing-still-sun" and it occurs when, due to the earth's tilt, your hemisphere is leaning farthest away from the sun. I don't know about you, but I refuse to shop at any store that doesn't acknowledge the leaning of my hemisphere. Never mind sweatshop labor or fair wages or union bashing, my shopping habits are based entirely on the earth's tilt. A group of national newspapers have paid Â£170,000 [roughly $330,000] to a man they falsely accused of involvement in the "liquid bomb" plot to blow up planes at Heathrow airport. Lawyers for Carter Ruck, representing Amjad Sarwar, said he had been paid Â£170,000 by the publishers of the Guardian, the Observer, the News of the World, the Mirror, the Daily Mail, the Mail on Sunday, the Evening Standard, the Independent, the Times, the Daily Express and the Daily Star. Each newspaper has already published a full apology to Mr Sarwar, who lives in High Wycombe, after falsely suggesting that he was suspected of being involved in the alleged plots to blow up a number of British aircraft using "liquid bombs" in August. Apologies currently online include those from the Guardian, the Observer, the Mirror, and the Independent. "Mr Sarwar has never been arrested, nor questioned, nor detained by the police on suspicion of involvement in the 'liquid bombs' plot or for that matter any other alleged terrorist plots or activities, and there are no grounds for suspecting any such involvement," Mr Sarwar's solicitor, Adam Tudor, said in the high court today before Mr Justice Eady. "The articles caused Mr Sarwar great distress and embarrassment at a time of particularly heightened sensitivity in relations with the Muslim community, and indeed led Mr Sarwar to fear for his own and his family's safety in light of possible reprisal attacks." The newspapers apologised to Mr Sarwar and paid his legal costs. Apart from the quoted report from the Guardian, news of this settlement can be found in the Times and some regional papers (here, here, and here). But the other named papers have been silent on the issue. This is an updated version of the piece that appeared yesterday at Truthout.org. 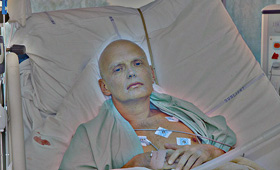 Everyone knows that Russian exile Alexander Litvinenko was killed by radiation poisoning in London last month. But beyond that bare fact, almost nothing is clear about the case. The truth has disappeared, probably forever, into the shadowlands â€“ that murky confluence of crime, violence, money and politics where so much of the real business of the world is conducted. However, an examination of some of the curiously overlooked aspects of the affair might send at least a few shafts of light into the cloud of unknowing that has enveloped Litvinenko's death. However, it is important that when we examine the subject of ethnic cleansing in Palestine, we take into account its various dimensions, one of which is the accompanying racist discourse, which has become part and parcel of Israelâ€™s ethnic cleansing policies. It all happened while America slept. As America slept, airline jets appeared in the azure blue New York Skies some five years back and within minutes bumped through tall wonders of human achievements reducing them and their occupants to a tangled mass of steel, concrete and human flesh. While the world stood horror-struck and frozen from the pain of the victims and the sheer scale of the crime, somewhere in some dark unlit corners of America, a small leering cabal of malicious, hateful and warmongering few backslapped each other. But America slept. As America slept, this small but ruthless group of men stole democracy from the American people and almost knocked her over with a noxious blow of fascism. The political philosophy of these creatures sent instant shivers up the collective spine of global citizenry. But America slept. I did something worse than St. Augustine did when I was a kid. I must confess I broke into a house on the other side of town, and I did it just because it was such an ugly beat-down house that needed work so badly. Well, that and I kind of wanted to move out of my parents'. I broke in at night and I started the renovations. I smashed a lot of the furniture up and actually knocked out a couple of walls. I destroyed the electric panel and stopped up the toilets. The place was a serious, serious wreck, and I was pretty tired, and the owners came home. They were an elderly couple, and they threatened me and threw stuff at me, but â€“ I'm ashamed to say -- I got a little rough with them and put them in their place. The trouble was, there were two of them and the phone still worked. One of them called the cops, who showed up pretty fast. Historically, it has been the CIA which up until the 1990s did the dirty work for US imperialism as the record clearly shows. However, the CIAâ€™s record in overthrowing foreign governments is far from being a success story. A new strategy was needed, and one which was untainted with the â€˜dirty tricksâ€™ label of the Nixon years and which could be sold to the public under the umbrella of â€˜spreading democracyâ€™, Western-style of course. Aside from the obvious harnessing of the corporate and state media in this process has been the creation of innumerable â€˜foundationsâ€™, â€˜NGOsâ€™ and spin-offs of the various organs of the state such as the United States Agency for International Development (USAID) and a plethora of quasi-governmental structures like the National Endowment for Democracy [sic] or NED. Big business has been an integral part of this process funnelling literally billions of dollars into a plethora of foundations and â€˜think tanksâ€™ which work hand-in-glove with the state in not only projecting the capitalist way of life but in directly interfering in the internal affairs of foreign countries whenever â€˜private propertyâ€™ is seemingly threatened. The Holiday Season has arrived, unfolding before us, like a cheap vinyl wallet, here in The United States of American Express. The days spill forth, their hours comprised of shopping and shooting sprees, of retail and retaliation. Jingle bells and the crackle of gunfire. This is the way an empire falls, with armies of confused killers abroad and legions of killer clowns at home. A decade and half ago, we watched smugly as The Kremlin came undone. Yet, somehow we believe ourselves to be immune from the rot that causes empires to collapse from within. The Social Realist poets of the former Soviet Union made themselves the objects of much (deserved) derision, when, in the service of the dogmatic dictates of state communism, they penned poetic odes to crop yields, tractors and other farm implements. Jimmy Carter was the latest to use the M Word. The former president said he believes the "occupancy of Iraq and all the consequences of it are a big mistake." This echoes John Kerry's infamous 1971 question: "How do you ask a man to die for a mistake?" Hmm...perhaps recalling a few details about the Vietnam "mistake" might shine some light on the Iraq "blunder." In 1954, Vice President Richard Nixon explained the need for U.S. intervention in Southeast Asia: "The Vietnamese lack the ability to conduct a war or govern themselves." Over the next two decades, the U.S. (by mistake?) dropped the equivalent of one 500-pound bomb for every person living in Vietnam. (Those bomber doors really needed better latches.) In 1966, David Lawrence, editor of U.S. News & World Report, wrote: "What the United States is doing in Vietnam is the most significant example of philanthropy extended by one people to another that we have witnessed in our times." When challenged with stories of American atrocities in Vietnam, Lawrence corrected his little gaffe, "Primitive peoples with savagery in their hearts have to be helped to understand the true basis of a civilized existence." When at war with savages, you can rationalize dumping 400,000 tons of napalm on them. In fact, the only thing America did wrong in its "effort to bring progressive politics or democracy to this region" was not coming down hard enough on this darky riff-raff: "Had we properly occupied the country, and begun political therapy, it is possible an American iron fist could have held Iraq together long enough to put it on a new course. But instead we created a vacuum by not deploying enough troops." Instead, we took it easy on them -- I mean, Jesus H. Jiminy Cricket Walker Christ, we only killed 600,000 of them; what kind of pussyfooting around is that? -- and look what happened. A Sunni insurgency sprang up, whose only goal -- whose ONLY goal, mind you -- was to make America look bad: "America must fail in its effort to bring progressive, etc., etc. America must fail â€“ no matter how many Iraqis have to be killed, America must fail." What was their "only one goal" again, Tom? Oh yeah: America must fail. Not a single ding-dang one of them ornery critters ever had any other motive whatsoever to take up arms against an army of foreigners who had invaded and occupied their country. From Erinys website. Kalashnikovs for sale or rent. As Beatroot notes, the crescendo of Russophobia has climaxed into the international press declaring a new Cold War. Are we at war with Russia? Well, with Putin, certainly, in case anyone hadnâ€™t noticed. Ever since he started throwing his oil weight around. Itâ€™s a war which puts some very strange bedfellows on the same side. Martin Kelly, who has dug up any number of iffy relationships in the Litvinenko affair, yesterday connected Boris Berezovsky, Erinys, Bell, PR and Iraq. And by association, The Blairs and Richard Perle. Er, what?